Based on the literary classic by James Fennimore Cooper, THE LAST OF THE MOHICANS takes place in the majestic mountains and awe-inspiring forests of war-torn Colonial America. In the midst of a bloody battle between British, the French and Native American allies, Cora Munro (Madeleine Stowe, Twelve Monkeys, We Were Soldiers), the aristocratic daughter of a British Colonel and her party are captured by a group of Huron warriors. Fortunately, a group of three Mohican trappers, including Hawkeye (Day-Lewis), a rugged frontiersman and the adopted son of the Mohicans comes to their rescue. A passionate romance soon blossoms between Cora and Hawkeye, but many forces test their love as they continue to journey through the Frontier. 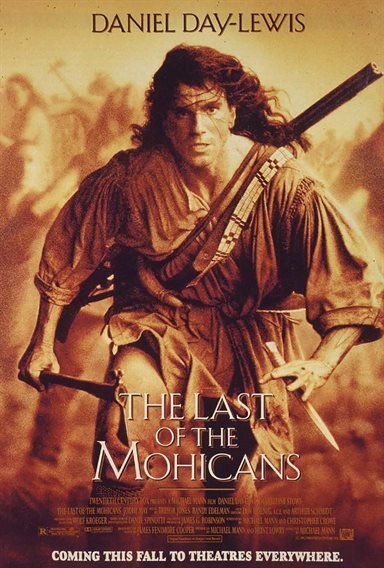 Download The Last of the Mohicans in Digital HD from the iTunes store. The Last of the Mohicans images are © 20th Century Fox. All Rights Reserved. 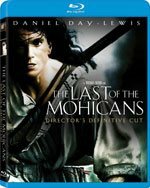 Out on Blu-Ray from 20th Century Fox is The Last of the Mohicans, but rather than being the original theatrical release, this version is Michael Mann's "Definitive Cut". The Definitive Cut adds several scenes that were not seen in the original release, mainly revolving around the relationship between Hawkeye and Cora Munro. The story is a remake of the 1936 version of the film, which has a few variations from the original book. Daniel Day-Lewis plays Hawkeye, adopted son of Chingachgook (played by Russell Means). Chingachgook is the Chief of the Mohican tribe, and along with his son, Uncas (played by Eric Schweig) are the last surviving members of it. Set during the early part of the Seven Years War (known in the United States as the French & Indian War), these three see their path intersect with Alice and Cora Munro (played by Jodhi May and Madeleine Stowe respectively) who are enroute to join their father, Colonel Munro who is stationed at Fort William and Mary. The movie as it was originally released seems to be billed as an action-adventure but rather it's a love story hiding as an action-adventure. The Definitive Cut improves upon the character development by improving on the relationship between Cora and Hawkeye. Some of the extra scenes seem awkward as they don't really expand upon the story, until you watch the "Making of" featurette included on the disc. The featurette really delves more into the background of Hawkeye and explains better some of the film and scenes that don't really fit with the love story. Additionally, it shows why Daniel Day-Lewis is such a wonderful actor - he trains like the character he is playing. He learns, he studies....he becomes the character. If you are fan of his work, and you haven't seen this film yet - watch it. It's one of his best. The rating for this disc is below an "A" because of the general lack of features. The disc includes the movie, commentary by Michael Mann, the new featurette, and theatrical trailers. In this day and age a few more extras are expected, and so while the movie itself is an "A", this release warrants only a "B" for that reason.